Watch her 2014 biopic Mary Kom and within a few moments, you will realise the challenges that her journey has been littered with. You are taken up by her struggles to overcome all the odds. 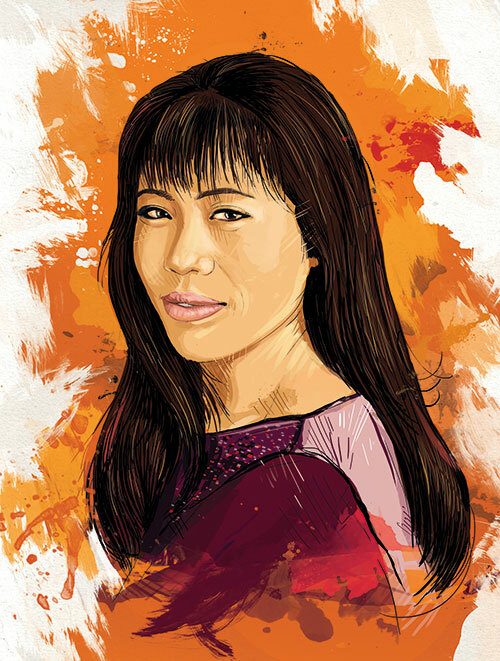 The only Indian woman boxer to have won a medal at the Olympics, five-time boxing world champion Mangte Chungneijang Mary Kom has given — and continues to effortlessly give — her all to her real-life roles of pugilist, wife and mother. When did you decide that you wanted to pursue boxing? I liked martial arts since my childhood, so when I had a chance to try my hand at boxing, I didn’t even give it a second thought. I was able to learn quickly and within three months won the Best Boxer Award at the First State Level Invitation at the women’s boxing championship in Manipur. That reinforced the idea that I had a future in the boxing ring. Worrying has no outcome, so stay happy and leave no room for sorrow. Discrimination, insults, being talked down to and opposition from my family — but I would say the most challenging one was poverty. As a little girl, I couldn’t have what I wanted and needed. And that kept me going even when things got tough. Many a time I did want to give up, but I was determined to win in life and change my family’s destiny. It was the one where I bagged my first international medal, a silver one, at the 2001 Women’s World Amateur Boxing Championships in Pennsylvania in the US. This infused a new confidence within me. It definitely feels good to have done and achieved so much. I am happy to be able to set an example for my fellow athletes and young girls. I would like to encourage girls to opt for a career in sports as it is one of the best professions in the world. Who is your sporting icon? What’s the most important piece of advice you’ve been given and have not forgotten? My dad always taught me, ‘You will get what you sow’ and this has constantly reminded me to work harder and harder to reach greater heights. How has being a sportsperson and being in the public eye affected you? With recognition, life has become more hectic. The increased responsibility and pressure has meant that I now have to measure up to people’s expectations. There is a time and situation for everything. I am both easy-going and strict. In your leisure time, what is the one hobby that you like to pursue? What are you like outside of the ring? I am a good wife and mother and I think I am decisive, frank, friendly and honest. To fight in the Asian Games next year followed by the Tokyo Olympics in 2020 are my immediate goals. And, as far as the future is concerned, I want to establish a full-fledged boxing academy so as to produce more champions for the country with the help of my experience and skills.